"I think the two institutions have learned much from each other." It may not have been the biggest graduation ceremony in the University’s history: a little over 100 students receiving their degrees in business and science. 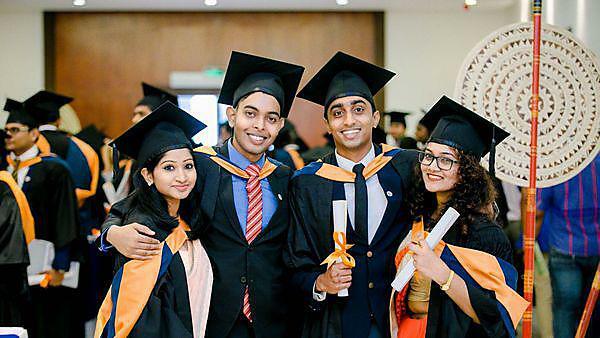 But what it lacked in scale it made up for in significance as the first cohort of Plymouth graduates in Sri Lanka took their bow and made their way into the world. It also signified a graduation of sorts for the University’s partnership with the National School of Business Management (NSBM) in Colombo. For more than three years the collaboration has grown, with Plymouth staff regularly flying 5,500 miles to deliver teaching, and students from both institutions taking up reciprocal international study opportunities. Dr Dulekha Kasturiratne, Associate Professor of Marketing, has been been lead academic on the partnership since its launch and has worked on a range of projects in the country, including the PMI2 programme, on developing entrepreneurship through collaboration. Eight courses were offered at the outset, covering business, computing, finance, accounting, marketing, and tourism and hospitality, and the University has since supplemented those with degrees in shipping and business communications. Faculty of Science and Engineering, swing into action. Flying out for two weeks at a time, they deliver around half of the final year modules in person, and validate the rest. With demand for higher education in Sri Lanka outstripping supply, the partnership is being closely monitored by the country’s government. Indeed, the graduation brochure for the Plymouth event carried no less than seven introductions from heads of state and government leaders, including the President and Prime Minister. NSBM is taking steps to meet that extra demand by creating a 26-acre green campus in Homogama, which will enable the school to enrol up to 30,000 students, and will contain in-house supermarkets, banking facilities, and business centres. With new courses under discussion, not to mention interest being expressed in our marine and maritime expertise, there is potentially an even greater role that Plymouth might play in Sri Lanka in the future.